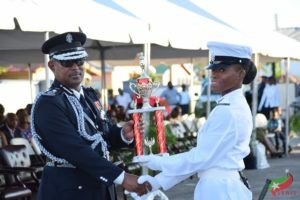 Basseterre, St. Kitts – As the St. Kitts-Nevis Defense Force Band played “Auld Lange Syne,” they slow marched two-by-two and exited the parade square with friends, family and well-wishers looking on with pride. The occasion was the 40th graduation ceremony of the Police Recruit Training Course No. 41, which took place at the Police Training School in Basseterre Dec. 12. The 34 men and women who had successfully endured one of the longest training courses in the history of the police force were taking part in a symbolic act that marked they were no longer police recruits, but police officers. During the ceremony, they also delighted the audience with an impressive and complex drills display, in which they formed the digit 41 – the number of the course. Constable Akiel Jones was also awarded for “Best at Rifle Shooting.” Constable Elrick Prentice won the award for “Best at Pistol Shooting” and “Best at Weapon Training;” the awards for “Best at Self Defense” went to Constable Emerson Archibald; “Best at Police Subjects” and “Best at Evidence and Procedure” went to Constable Bentley Bissette; and "Results in Final Exams” went to Constable Jensen Charles who was also selected as the “Most Improved” student. Constable Kareem Romney was the “Most Disciplined” student. There was also an award for the best syndicate that went to 13 officers who comprised one of the two syndicates. According to Inspector Eldrin Dickenson, commandant at the Police Training Complex, training courses would usually run for six months. However, Course No. 41 actually lasted for nine months as the training was interrupted several times. Significant to note would have been when the recruits were called upon to perform actual police duties as part of Operation Mid-Sweep and during the passage of hurricanes Irma and Maria. The course itself was a combination of in-class and on-the-job training. Inspector Dickenson also said that the group was diverse – of the 34 graduates, nationals of Jamaica, Haiti and Guyana were among them. Commissioner of Police Ian Queeley said that the common thread binding the group together was their desire to serve and he encouraged the them to do so with integrity. Senior Minister and Minister of Nevis Affairs, Labour, Social Security and Ecclesiastical Affairs Vance Amory delivered the featured address in lieu of the prime minister who was in the House of Assembly at the time. 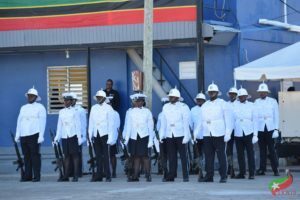 Minister Amory urged the new police officers to commit themselves to ensuring that St. Kitts and Nevis was a place of peace.